I finally got around to finishing the updated version of the CRAMPS board. This version focused on simplifying the design as much as possible, and I really like the end result. It feels much closer to the original RAMPS for the Arduino Mega in spirit than the previous 1.0 version and the RAMPS-FD. The design files remain on github, and the home page for the design is still the CRAMPS page on the RepRap wiki. A BOM file including Mouser and Digi-Key part numbers is also available via Google docs. The boards have been ordered, and should arrive before the end of May. While the design is fully open, not everyone wants to build their own boards from scratch. I am working on getting someone to build and sell completed boards, so stay tuned for updates! 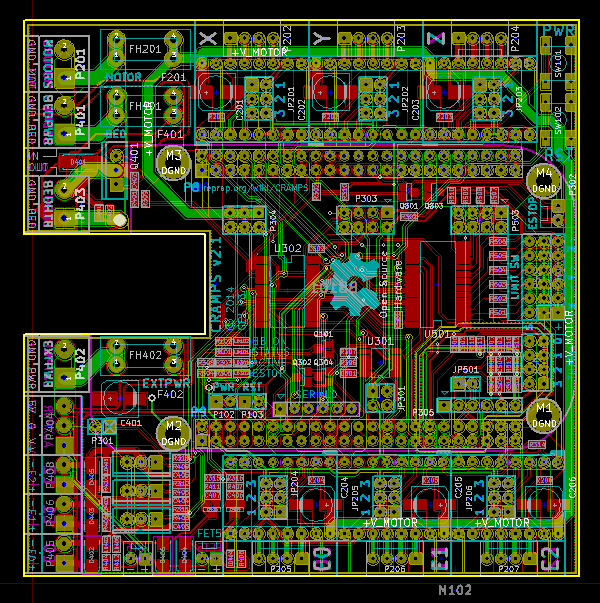 UPDATE: 2014.05.12 - The first batch of 20 boards has shipped, now the 0-30 day wait for a "registered air parcel" begins. Yes beeing able to buy a solution spares a lot of time. Keen to get a board here in aus.. pity you need to buy 3x at a time from OSH Park. I'd be willing to solder all the components..call me crazy but it sounds like fun.